UD professors Debra Hess Norris (standing, left) and Jennifer Jae Gutierrez (standing right) instruct their Russian colleagues on techniques for inpainting damaged 19th-century photographs using watercolors and other media. Tatyana Sayatina uses watercolors to inpaint losses in a silver-gelatin photograph. She is the conservator of organic materials at State Hermitage Museum and leader of the museum's future photograph conservation laboratory. 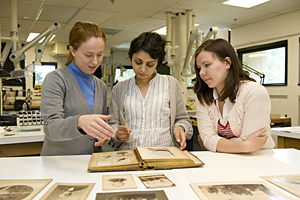 From left, Tatyana Sayatina, Natalya Avetyan and Natalya Laitar examine a collection of 19th-century photographs during the UD workshop in the art conservation laboratories at Winterthur Museum and Country Estate. 3:13 p.m., Aug. 5, 2010----The University of Delaware's Department of Art Conservation has a deep commitment to the preservation of cultural artifacts and antiquities worldwide. And now the department has welcomed Russia's prestigious State Hermitage Museum in St. Petersburg to the list of international institutions with which it is sharing its expertise. The training effort is part of a four-year, $3.4 million initiative supporting photograph conservation at the Hermitage led by the Foundation of the American Institute for Conservation of Historic and Artistic Works (FAIC) and funded by the Andrew W. Mellon Foundation. From July 5-12, in the art conservation laboratories at Winterthur Museum and Country Estate, Debra Hess Norris, UD's Henry Francis du Pont Chair of Fine Arts, chair of the Department of Art Conservation and vice provost for graduate and professional education, and Assistant Prof. Jennifer Jae Gutierrez presented a workshop on the conservation of 19th-century photographic print materials to three Hermitage staff. They included Natalya Avetyan, curator of photographs in the Hermitage Department of Russian History and Culture; Natalya Laitar, conservator of paper and oriental painting; and Tatyana Sayatina, conservator of organic materials and leader of the museum's future photograph conservation laboratory. “Our July workshop was the first training opportunity in this project to be held in the United States. It was a pleasure to have our colleagues here in Delaware, and I look forward to continuing this collaboration,” Gutierrez said. Founded in 1764 by Catherine the Great and opened to the public in 1852, the State Hermitage Museum encompasses nearly 3 million works of art and artifacts, including the largest collection of paintings in the world. Among the museum's historic buildings is the Winter Palace, the former state residence of the Russian emperors. The museum also has sizable photograph collections. A Mellon-funded survey in 2008-2009 identified 44 repositories holding over 472,000 photographs. Among the subjects are historic scenes of St. Petersburg and family pictures belonging to Czars Alexander III and Nicholas II and members of their families. Aside from in-depth photograph conservation training for selected Hermitage staff, the FAIC initiative includes assistance with the design and equipment specifications for a new photograph conservation laboratory and dedicated storage facility at the Hermitage as well as collections digitization and cataloguing and Russian translations of core conservation literature. The training components will take place in the United States, Europe and Russia. Norris is serving on FAIC's international advisory committee for the initiative. The committee includes specialists in the fields of photograph and preventive conservation, education, documentation, cataloguing, digital imaging and scientific research. UD's Department of Art Conservation administers both an undergraduate and graduate program, the latter in collaboration with Winterthur Museum and Country Estate. 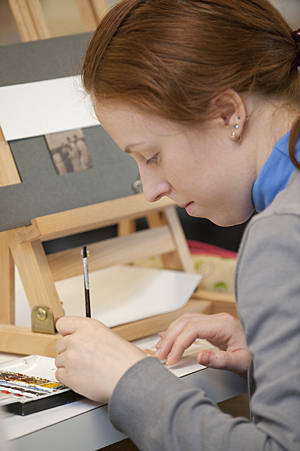 The Winterthur/University of Delaware Program in Art Conservation is one of only four programs in the United States to offer the master's degree in art conservation. 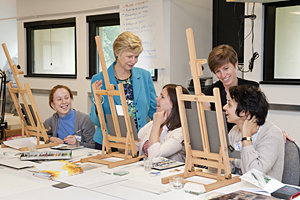 UD faculty and students have access to 26 well-equipped conservation studios, laboratories, examination rooms, and workshops in the Louise du Pont Crowninshield Research Building at Winterthur. This building houses one of the country's largest and best-equipped museum analytical laboratories and conservation studios. UD students have regular access to Winterthur's internationally recognized collections -- nearly 100,000 American decorative art objects are housed in 180 period-room settings and an associated exhibition building.